+ Cameron Lee, professor of marriage and family studies, lectures on the subtle complexities of integrating psychology and theology, the mental backdrops and narratives that shape our choices, and how the inherent logic of the beatitudes can shape therapists and ministers alike into agents of shalom. 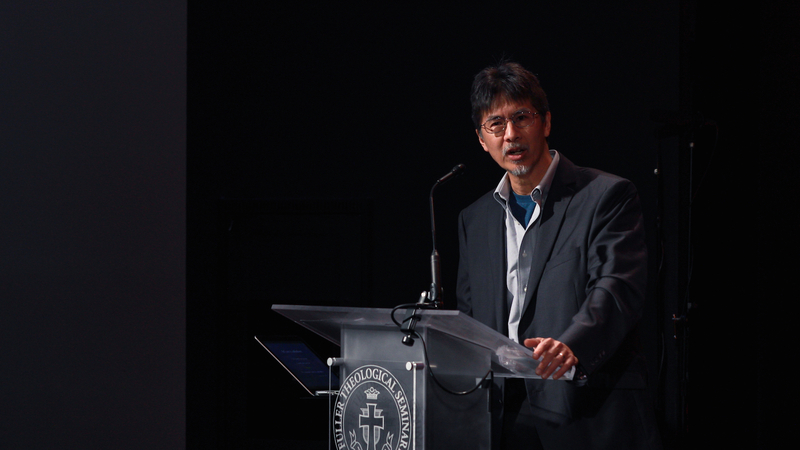 Cameron Lee, professor of marriage and family studies, spoke at the 2018 Fuller Symposium on the Integration of Psychology and Theology, an annual lectureship hosted by Fuller’s School of Psychology. The annual lectureship features a nationally recognized scholar focusing on a single integrative issue. + Hak Joon Lee, Lewis B. Smedes Professor of Christian Ethics, responds to Cameron Lee’s lecture, reflecting on today’s political context and the transfiguring power of the Spirit.